Mike Freeman (vibes/coro); Guido Gonzalez (trumpet/coro); Ian Stewart (bass); Roberto Quintereo (perc. ); Joel Mateo (drums). I'm not normally drawn to Latin albums - they tend to sail too close to the easy listening area. This one does head in that direction but, fortunately, stays far enough away to avoid boredom or ennui. This is mainly due to the trumpet of Gonzalez who avoids the bravura of the bullfight preferring instead the cool clear sound of say Arturo Sandoval without overdoing the pyrotechnics. 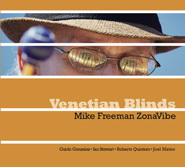 Freeman's vibes bring to mind Cal Tjader with a dash of Milt and blends effectively over the turbulence of the fluctuating South American rhythms. Not surprisingly, Tito Puente is an influence and the title track is dedicated to the 'Mambo King' whose rolled-up vibraphone keyboard would often be referred to as Those Venetian Blinds. Other Puente moments are on Mambo Kings; Night Crawlers and Qué Tal Tio (What's Up Uncle?). Bobby Hutcherson is also acknowledged on three tracks - Clutch the Hutch; Bobby Land and House of Vibes. The remaining tracks, says Freeman, are a family affair. Fancy Free (written after his daughter's first birthday); What's Up With the Moon? (a text from his son on a night out) and Mr. Snacky (Freeman is fanatical over healthy snacks). Well worth checking out and, despite what I said at the start of the review, by the time I reached the end I concluded that it was closer to the easy-listening coastline than I first thought. Even so, I think I could safely play it on the car stereo without falling asleep at the wheel although don't quote me on that!